This was also just about a perfect meal, for the cook and the diner, but to be totally honest, I have to quickly add that it gets that salute only by the standards and means of a modest kitchen and a quite-ordinary competence. Also, it was the child of necessity, or more exactly, the happy outcome of a glitch in plans which is not unusual. On my trip to the Greenmarket on Friday I was disappointed once again in not finding John Dory fillets (they had sold out much earlier). I’ve become accustomed to the need for adjusting to whatever might be available in the fish stalls (or those of any other venders) at the time I arrive, which is often well past the hour when the most [exciting?] fish may have been scooped up by its fans. When I stopped by Pura Vida Fisheries this Friday at about 1:30 in the afternoon, Paul suggested triggerfish fillet. I don’t think I had ever eaten it before, and I’m certain I hadn’t cooked it. Apparently even the Grey triggerfish is somewhat rare this far north. Perhaps because its habitat is along rocks along the shore, where it dines on shellfish (yum! ), it’s not really fished commercially, but this is the time of year it’s most likely to be found, usually by anglers. But then we both noticed that there were only two left inside the pan resting on the the ice, and they turned out to weigh only about 8 ounces altogether. 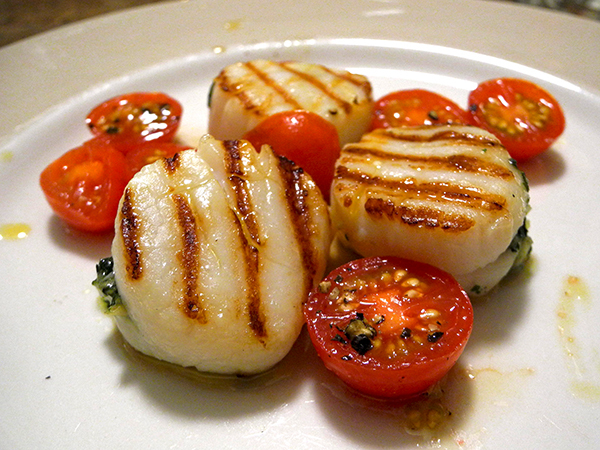 I decided that wasn’t quite enough for the two of us at dinner, so I added 6 large sea scallops to my ‘catch’, and added it to the fillets already on ice inside my insulated bag. I would sort out the menu later. 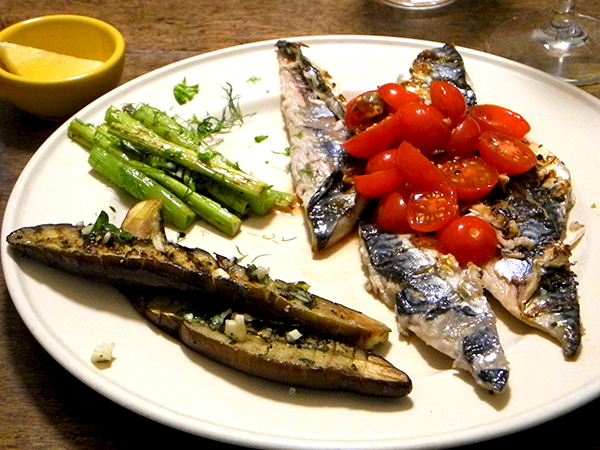 The meal I assembled, of two courses, each featuring some great seafood, was otherwise very minimal in both outline and execution, allowing the quality of some very fresh ingredients to star without any distractions. There was another first last night: I used my new [previously-owned] tin-lined copper au gratin pan for the very first time, employing it here to sauté the Triggerfish fillets. I have never cooked with copper pans, and I didn’t buy it for display (I leave that to the seasoned-polished cast iron). I loved the copper thing, finding it, at least in this outing, most remarkable for the speed with which it heated. While Scallops are a familiar presence on our table, the Grey Triggerfish doesn’t even make it to our fisher-owned market stands very often, but now I know that it’s a great treat when it does. I wrote above that this fish hangs out around rocks, and so, in addition to a great texture unlike anything else I can think of, it has an attractive, quite subtle, rather sweet taste, with a finish suggesting crustaceans. It does indeed. Lovely. Because it involved no elaborate preparation, the second seafood course followed the first with a minimum of delay. Nice. I ended up inventing a recipe for the Triggerfish myself, because I had found nothing useful in any of my cookbooks, in my files, or anywhere on line. 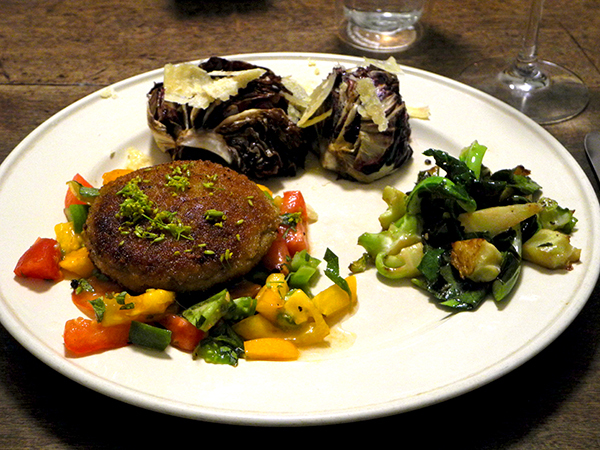 The dinner was something of a improvisation for that evening, using ingredients I had just found hanging around the kitchen (except perhaps for one very deliberate move, ahead of time, to defrost some frozen crab cakes). That may explain why, in the end, there was a lot going on with this entrée, but it was pretty tasty nevertheless. *Note: If you click onto this link, and if you have a Spotify account, you can see our entire playlist for the evening. We’re both very fond of Mackerel, even when we are unable to bring it home. 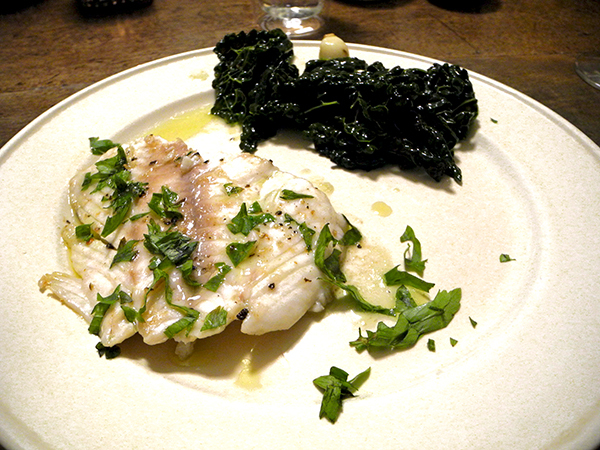 It’s become a very popular fish on our table, so popular that I’m going to have to come up with more alternatives to this excellent, and very simple Sicilian-inspired recipe from Michael White. I’ve decided to call it, or at least file it under ‘broccoli’, rather than ‘cauliflower’, but it doesn’t really matter what I call it. 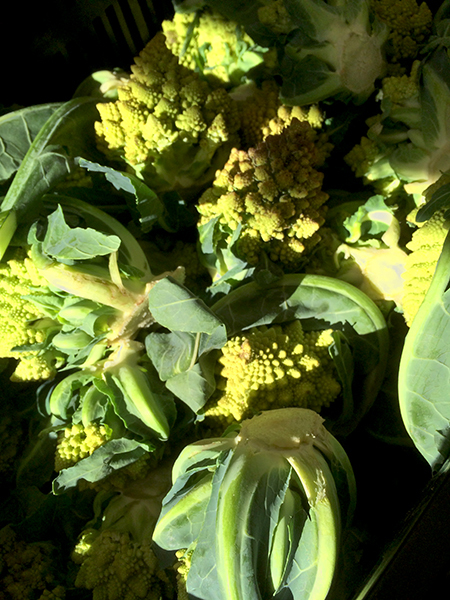 Romanesco is very beautiful, and very tasty. I think most people, when they first come across a head of this vegetable, have trouble believing it’s actually a natural form (in this image it looks quite unreal, or at the very least, magnified a zillion times). I think that was also my own experience, but once I was convinced there was nothing fake about them, I’ve found it difficult to avoid taking one home whenever I see them. The food photographer Laura Anderson has described Romanesco as “The helical cruciferous vegetable, which looks like the lovechild of cauliflower and broccoli with some alien DNA thrown in…”. Also, we note that it’s definitely chartreuse, a color which is not actually that common in the vegetable world. The recipe (which I halved) on which I based the meal was published in New York magazine over ten years ago, and it was attributed to Sara Jenkins; the source of the ingredients is described below. I improvised by adding some diced fresh hot peppers. I love zucchini flowers, but I refuse to do any deep frying at home, so most of the time I have to sit on the sidelines when I encounter the ingredient in a market. 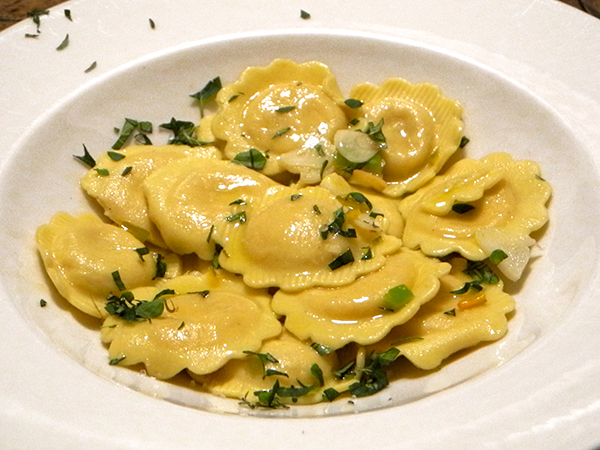 That’s why I was so excited last week when I came across Luca Donofrio latest fresh pasta innovation at Eataly, fiori di zucca-filled ravioli. I had to put off a purchase that day, but resolved to return when I did not already have a commitment to ingredients for a different meal. Late Sunday afternoon I braved the crowds of tourists (and home cooks) inside that spectacularly successful food emporium, and managed to bag (box) some of the pasta. 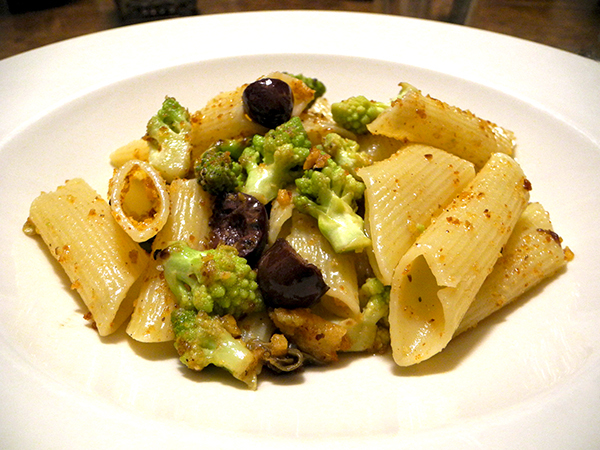 I didn’t want to upstage the star ingredient, so I thought seriously about how I would ‘dress’ the pasta with a sauce. Most of the decision was made as soon as I spotted a very small plastic bag inside of our refrigerator of what I believed were two ‘yum yum’ peppers. I had thought they had disappeared earlier within a mix of tiny parti-colored bell peppers. If they actually were yum yums, they were the peppers the young man at the Union Square market stall had described as sweetly flavorful, but when I tasted a tiny sliver of one, raw, I decided they should not be added without some caution (they were far more hot than sweet, at least until introduced into the sauce and the ravioli, but they were certainly flavorful. They made the dish far more sophisticated than it would have been otherwise, and the taste of the fiori di zucca survived. You never know about peppers, I’ve learned, or at least I never know about peppers. NOTE: The image above does not include the freshly-ground black pepper and grated Parmesan cheese added to the top of the pasta after we had tasted the dish, and after I snapped the picture.